What is the Level 4 Certificate in Education and Training? This week we are excited to be publishing our first further education title A Complete Guide to the Level 4 Certificate in Education and Training by Lynn Machin, Duncan Hindmarch, Sandra Murray and Tina Richardson. Following Sandra’s blog post yesterday we are pleased to present the first of 4 extracts from the book designed to give you a taster of the content. 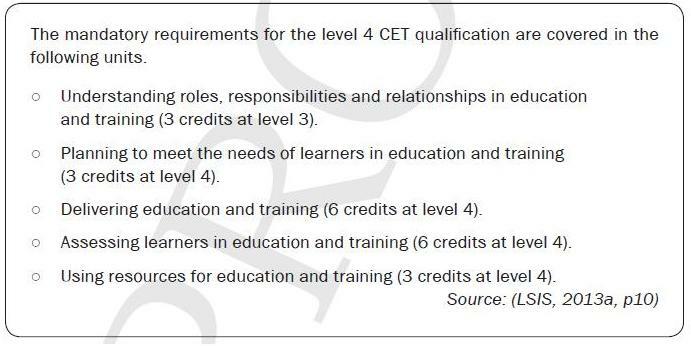 Let us know what you think, It is taken from Chapter 1: What is the Level 4 Certificate in Education and Training? are willing to undertake an initial assessment of their skills in English, Mathematics and ICT, record their development needs and to follow an action plan to address them if necessary. One of the mandatory units is at level 3. The other four are at level 4. Optional units are available at levels 3, 4 and 5.